According to BCG research report in July of this year – 96% of US consumers say they trust brands that use content to inform them, help them meet a need or that provides useful information without trying to sell them something. Sensis social media report found that while almost 50% of consumers now access social media every day, only 31% of SME’s are actively operating a social media engagement strategy. If you’re not actively leveraging a social media engagement strategy, or maybe your current strategy is not generating the results you want – this show is for you. 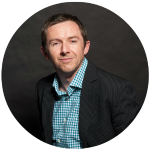 Joining me today is Simon Mossman – formerly a journalist, but now leveraging his wealth of knowledge to help business professionals, companies and organisations to amplify their market influence through mainstream, digital and social media. Understanding the No.1 “must-do” tactic to put your media & marketing communications on the right track for success. Getting the six tips to leveraging the news cycle to build influential exposure for your business. 96% of US consumers say they trust brands that use content to inform them; help them meet a need or; that provide useful information without trying to sell them something (BCG research report, July 2015). Simon Mossman was a journalist in a previous life but today he helps business professionals, companies and organisations to amplify their market influence through mainstream, digital and social media. Devoted dad, husband, adventurer, explorer, couldabeen Everton soccer star, frustrated guitarist & mandolin player.